Imelda's Closet [C7194] - $14.00 : Yarn Tree, Your wholesale source for cross stitch supplies. A cross stitch pattern by Blackberry Lane Designs. 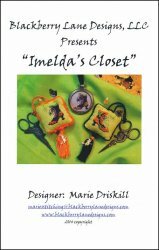 Imeldas's Closet is filled with some fun and funky Halloween shoes. Stitch counts: Happy Hallow-eek 186 w x 66 h and Witch Boot To Wear! 41 w x 43 h.